The cosmetic line Benefit has the most adorable gift set called "The Girl's Night In Kit," which includes various pieces of make up, a small cosmetic bag, an instruction guide, and magnets. This is very clever because the make up will be used of course and eventually tossed in the trash but the fun magnets and cosmetic bag will be kept a lot longer. Further the promotional products AKA: swag (magnet and bag) are very inexpensive so you can image how profitable a keep sake kit like this can be overall when you see it retails for $90! 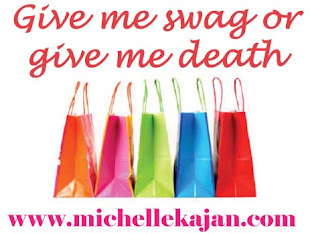 Swag can be profitable and add value a gift with purchase if used in the right way! Another Sundance Film Festival has come and gone! I just had to blog about the clever little invitations T-Mobile concocted for their famous T-Mobile Diner where all the celebrities hob knob. If you've ever heard of Sundance then you know it's held in the quaint little mountain town of Park City, Utah where there is lots of culture and lots of snow. Snow, cold and chic being the theme of the Diner, the invitation followed suit. Smores Kit Invitations went out to all the VIP's in Los Angeles. With careful attention to use gourmet graham crackers, marshmallow's and the chocolate bar was the actual invitation. A great case study of making an ordinary product extraordinary by using a branding concept. The Fashion Institute of Design and Merchandise hosted a fab Alumni Dinner at The London Hotel. Among the fantastic gifts at auction was this fantastic leather executive business bag, the perfect gift for busy on the go Alumni. Colleges across the United States retail merchandised company stores and it's such a profitable way to raise money for you're school. Even fashion schools have to make a fashion statement! a VIP event. As the champagne flowed, the ladies indulged in shopping an exclusive 60% off while mingling the night away. The SWAG bags were equally as luxe with a signature Michael Stars Umbrella SWAG and tank. Also inside the swag bag a coupon to the spa and a Garnier Fructis Conditioner. If you're not familiar with the UBER chic and popular Michael Stars I'm sure you've seen all of the hot celebrities wearing Michael Stars gear such as Lindsay Lohan, Catherine Zeta, Eva Longoria. You can view the full Michael Stars line or find a store at www.michaelstars.com. It's officially tradeshow month...Woo hoo...New potential business! -Create a theme and make sure that everyone & everything matches; from the wearables your booth staff wears to the premium you giving away, to the signage & collotoral. -Choose a giveaway that will draw attention to your booth something that light's up or makes noise. Run a game like roulette or the "spin a wheel and win a gift game". -Have a few tiers of gifts for your repeat clients (a nicer gift) and general guests that visit your booth so they walk away with something that has your contact info. -Run a promotion in your booth. 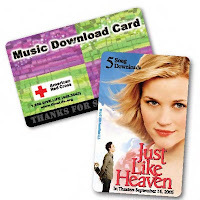 You can send out a flyer before the show offering a gift when they stop by or giveaway a newer SWAG incentive and one of my favorites the "music download card" which will make your guest go online and give you their contact info then they get their download. -So WOW at you're tradeshow and get new business! Happy New Year-Start 2009 off with a bang by focusing on your top tier of clients! As we move into a new year it's safe to say with our economic state the way that it is budget cuts are inevitable these days. I’m excited to report that my corporate clients and marketing teams have been getting clever and creative to pick out products for their events and promotions that are not only affordable but catered to a certain target market. Budget TID BIT: Clients are focusing & spending budgets on their TOP TIER of end users. This top percentage generally accounts for the largest percentage of business, repeat business and new business with referrals. "Happy 2009 card and include a custom calendar" which will sit in their office all year long and keep you front and center! 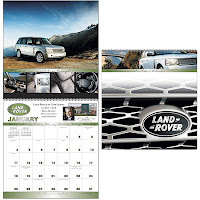 Of course remember to customize your calander to you're business by using images, including important contact info, and preprinting important promotions inside.